Nothing has a stronger bond than family. We are so connected to our families these days and we love sharing moments through digital images and videos. It is so enlightening to see an image of your child walking for the first time or your son graduating from College or your daughter at her dance recital. All of these moments bring us closer and so much more a part of our family lives. Now is the time, more than ever to create a beautiful family portrait of the whole family together. Hanging your family portrait on your wall in your home says so much more. It reinforces our families as a whole, in the same room, holding each other and smiling as we share a sense of security, love, and unbroken ties that only our family can share. There is no better time to give the gift of a family portrait than now, for the holidays, when we look forward to spending time with our families more than ever. $500.00 Gift Certificate includes studio Portrait Session, personal consultation, in studio viewing and one Fine Art Portrait on Canvas with enhancements ( 10" size). 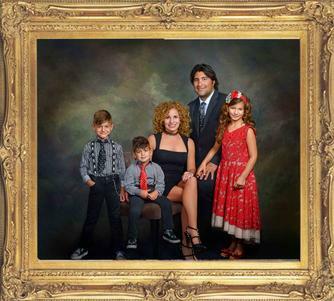 This is a formal portrait of your family, your children or yourself. Cannot be transferred, exchanged for or combined with any other product or session. 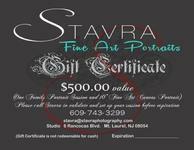 This Gift Certificate is valued at STAVRA Photography Studio only. Click below to purchase your Gift Certificate now. Once you have filled out info and purchased, you will recieve a confirmation and your gift certificate will be mailed to the address provided below. If this is a gift, please let us know who the gift is going to.